Concept, first introduced by analytical psychologist Carl Jung, which holds that events are "meaningful coincidences"
This article is about the philosophical concept. For other uses, see Synchronicity (disambiguation). Synchronicity (German: Synchronizität) is a concept, first introduced by analytical psychologist Carl Jung, which holds that events are "meaningful coincidences" if they occur with no causal relationship yet seem to be meaningfully related. During his career, Jung furnished several different definitions of it. Jung defined synchronicity as an "acausal connecting (togetherness) principle," "meaningful coincidence", and "acausal parallelism." He introduced the concept as early as the 1920s but gave a full statement of it only in 1951 in an Eranos lecture. In 1952 Jung published a paper "Synchronizität als ein Prinzip akausaler Zusammenhänge" (Synchronicity – An Acausal Connecting Principle) in a volume which also contained a related study by the physicist and Nobel laureate Wolfgang Pauli, who was sometimes critical of Jung's ideas. Jung's belief was that, just as events may be connected by causality, they may also be connected by meaning. Events connected by meaning need not have an explanation in terms of causality, which does not generally contradict the Axiom of Causality but in specific cases can lead to prematurely giving up causal explanation. Jung used the concept in arguing for the existence of the paranormal. A believer in the paranormal, Arthur Koestler wrote extensively on synchronicity in his 1972 book The Roots of Coincidence. The idea of synchronicity as extending beyond mere coincidence (as well as the paranormal generally) is widely rejected in the academic and scientific community. How are we to recognize acausal combinations of events, since it is obviously impossible to examine all chance happenings for their causality? The answer to this is that acausal events may be expected most readily where, on closer reflection, a causal connection appears to be inconceivable. The culmination of Jung's lifelong engagement with the paranormal is his theory of synchronicity, the view that the structure of reality includes a principle of acausal connection which manifests itself most conspicuously in the form of meaningful coincidences. Difficult, flawed, prone to misrepresentation, this theory none the less remains one of the most suggestive attempts yet made to bring the paranormal within the bounds of intelligibility. It has been found relevant by psychotherapists, parapsychologists, researchers of spiritual experience and a growing number of non-specialists. Indeed, Jung's writings in this area form an excellent general introduction to the whole field of the paranormal. ...it is impossible, with our present resources, to explain ESP, or the fact of meaningful coincidence, as a phenomenon of energy. This makes an end of the causal explanation as well, for "effect" cannot be understood as anything except a phenomenon of energy. Therefore it cannot be a question of cause and effect, but of a falling together in time, a kind of simultaneity. Because of this quality of simultaneity, I have picked on the term "synchronicity" to designate a hypothetical factor equal in rank to causality as a principle of explanation. Synchronicity was a principle which, Jung felt, gave conclusive evidence for his concepts of archetypes and the collective unconscious. It described a governing dynamic which underlies the whole of human experience and history — social, emotional, psychological, and spiritual. The emergence of the synchronistic paradigm was a significant move away from Cartesian dualism towards an underlying philosophy of double-aspect theory. Some argue this shift was essential to bringing theoretical coherence to Jung's earlier work. Even at Jung's presentation of his work on synchronicity in 1951 at an Eranos lecture, his ideas on synchronicity were evolving. On Feb. 25, 1953, in a letter to Carl Seelig, the Swiss author and journalist who wrote a biography of Albert Einstein, Jung wrote, "Professor Einstein was my guest on several occasions at dinner. . . These were very early days when Einstein was developing his first theory of relativity [and] It was he who first started me on thinking about a possible relativity of time as well as space, and their psychic conditionality. More than 30 years later the stimulus led to my relation with the physicist professor W. Pauli and to my thesis of psychic synchronicity." Jung believed life was not a series of random events but rather an expression of a deeper order, which he and Pauli referred to as Unus mundus. This deeper order led to the insights that a person was both embedded in a universal wholeness and that the realisation of this was more than just an intellectual exercise, but also had elements of a spiritual awakening. From the religious perspective, synchronicity shares similar characteristics of an "intervention of grace". Jung also believed that in a person's life, synchronicity served a role similar to that of dreams, with the purpose of shifting a person's egocentric conscious thinking to greater wholeness. My example concerns a young woman patient who, in spite of efforts made on both sides, proved to be psychologically inaccessible. The difficulty lay in the fact that she always knew better about everything. Her excellent education had provided her with a weapon ideally suited to this purpose, namely a highly polished Cartesian rationalism with an impeccably "geometrical" idea of reality. After several fruitless attempts to sweeten her rationalism with a somewhat more human understanding, I had to confine myself to the hope that something unexpected and irrational would turn up, something that would burst the intellectual retort into which she had sealed herself. Well, I was sitting opposite her one day, with my back to the window, listening to her flow of rhetoric. She had an impressive dream the night before, in which someone had given her a golden scarab — a costly piece of jewellery. While she was still telling me this dream, I heard something behind me gently tapping on the window. I turned round and saw that it was a fairly large flying insect that was knocking against the window-pane from outside in the obvious effort to get into the dark room. This seemed to me very strange. I opened the window immediately and caught the insect in the air as it flew in. 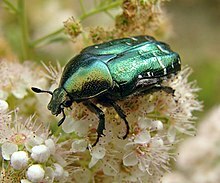 It was a scarabaeid beetle, or common rose-chafer (Cetonia aurata), whose gold-green colour most nearly resembles that of a golden scarab. I handed the beetle to my patient with the words, "Here is your scarab." This experience punctured the desired hole in her rationalism and broke the ice of her intellectual resistance. The treatment could now be continued with satisfactory results. The French writer Émile Deschamps claims in his memoirs that, in 1805, he was treated to some plum pudding by a stranger named Monsieur de Fontgibu. Ten years later, the writer encountered plum pudding on the menu of a Paris restaurant and wanted to order some, but the waiter told him that the last dish had already been served to another customer, who turned out to be de Fontgibu. Many years later, in 1832, Deschamps was at a dinner and once again ordered plum pudding. He recalled the earlier incident and told his friends that only de Fontgibu was missing to make the setting complete – and in the same instant, the now-senile de Fontgibu entered the room, having got the wrong address. Jung wrote, after describing some examples, "When coincidences pile up in this way, one cannot help being impressed by them – for the greater the number of terms in such a series, or the more unusual its character, the more improbable it becomes." Causality, when defined expansively (as for instance in the "mystic psychology" book The Kybalion, or in the platonic Kant-style Axiom of Causality), states that "nothing can happen without being caused." Such an understanding of causality may be incompatible with synchronicity. Other definitions of causality (for example, the neo-Humean definition) are concerned only with the relation of cause to effect. As such, they are compatible with synchronicity. There are also opinions which hold that, where there is no external observable cause, the cause can be internal. It is also pointed out that, since Jung took into consideration only the narrow definition of causality – only the efficient cause – his notion of "acausality" is also narrow and so is not applicable to final and formal causes as understood in Aristotelian or Thomist systems. The final causality is inherent in synchronicity (because it leads to individuation) or synchronicity can be a kind of replacement for final causality; however, such finalism or teleology is considered to be outside the domain of modern science. Mainstream mathematics argues that statistics and probability theory (exemplified in, e.g., Littlewood's law or the law of truly large numbers) suffice to explain any purported synchronistic events as mere coincidences. The law of truly large numbers, for instance, states that in large enough populations, any strange event is arbitrarily likely to happen by mere chance. However, some proponents of synchronicity question whether it is even sensible in principle to try to evaluate synchronicity statistically. Jung himself and von Franz argued that statistics work precisely by ignoring what is unique about the individual case, whereas synchronicity tries to investigate that uniqueness. Among some psychologists, Jung's works, such as The Interpretation of Nature and the Psyche, were received as problematic. Fritz Levi, in his 1952 review in Neue Schweizer Rundschau (New Swiss Observations), critiqued Jung's theory of synchronicity as vague in determinability of synchronistic events, saying that Jung never specifically explained his rejection of "magic causality" to which such an acausal principle as synchronicity would be related. He also questioned the theory's usefulness. In psychology and cognitive science, confirmation bias is a tendency to search for or interpret new information in a way that confirms one's preconceptions, and avoids information and interpretations that contradict prior beliefs. It is a type of cognitive bias and represents an error of inductive inference, or is a form of selection bias toward confirmation of the hypothesis under study, or disconfirmation of an alternative hypothesis. Confirmation bias is of interest in the teaching of critical thinking, as the skill is misused if rigorous critical scrutiny is applied only to evidence that challenges a preconceived idea, but not to evidence that supports it. Likewise, in psychology and sociology, the term apophenia is used for the mistaken detection of a pattern or meaning in random or meaningless data. Skeptics, such as Robert Todd Carroll of the Skeptic's Dictionary, argue that the perception of synchronicity is better explained as apophenia. Primates use pattern detection in their form of intelligence, and this can lead to erroneous identification of non-existent patterns. A famous example of this is the fact that human face recognition is so robust, and based on such a basic archetype (essentially two dots and a line contained in a circle), that human beings are very prone to identify faces in random data all through their environment, like the "man in the moon", or faces in wood grain, an example of the visual form of apophenia known as pareidolia. Jung and his followers (e.g., Marie-Louise von Franz) share in common the belief that numbers are the archetypes of order, and the major participants in synchronicity creation. This hypothesis has implications that are relevant to some of the “chaotic” phenomena in nonlinear dynamics. Dynamical systems theory has provided a new context from which to speculate about synchronicity because it gives predictions about the transitions between emergent states of order and nonlocality. This view, however, is not part of mainstream mathematical thought. According to a certain view, synchronicity serves as a way of making sense of or describing some aspects of quantum mechanics. It argues that quantum experiments demonstrate that, at least in the microworld of subatomic particles, there is an instantaneous connection between particles no matter how far away they are from one another. Known as quantum non-locality or entanglement, the proponents of this view argue that this points to a unified field that precedes physical reality. As with archetypal reasoning, the proponents argue that two events can correspond to each other (e.g. particle with particle, or person with person) in a meaningful way. F. David Peat saw parallels between Synchronicity and David Bohm's theory of implicate order. According to Bohm's theory, there are three major realms of existence: the explicate (unfolded) order, the implicate (enfolded) order, and a source or ground beyond both. The flowing movement of the whole can thus be understood as a process of continuous enfolding and unfolding of order or structure. From moment to moment there is a rhythmic pulse between implicate and explicate realities. Therefore, synchronicity would literally take place as the bridge between implicate and explicate orders, whose complementary nature define the undivided totality. Many people believe that the Universe or God causes synchronicities. Among the general public, divine intervention is the most widely accepted explanation for meaningful coincidences. Jung, Carl (1972). Synchronicity – An Acausal Connecting Principle. Routledge and Kegan Paul. ISBN 978-0-7100-7397-6. Also included in his Collected Works volume 8. Jung, Carl (1977). Jung on Synchronicity and the Paranormal: Key Readings. Routledge. ISBN 978-0-415-15508-3. Jung, Carl (1981). The Archetypes and the Collective Unconscious. Princeton University Press. ISBN 978-0-691-01833-1. ^ Tarnas, Richard (2006). Cosmos and Psyche. New York: Penguin Group. p. 50. ISBN 978-0-670-03292-1. ^ Bernard D. Beitman (2009) "Coincidence Studies: A Freudian Perspective..."
^ Casement, Ann, "Who Owns Jung?" Archived 2016-12-31 at the Wayback Machine, Karnac Books, 2007. ISBN 1-85575-403-7. Cf. page 25. ^ a b Jung, Carl G. (1993) . Synchronicity: An Acausal Connecting Principle. Bollingen, Switzerland: Bollingen Foundation. ISBN 978-0-691-01794-5. Since included in his Collected Works volume 8. ^ Roderick Main (2000). "Religion, Science, and Synchronicity". Harvest: Journal for Jungian Studies. Archived from the original on 2006-12-08. ^ a b Rushnell, S. (2006). When God winks. Atria Books. ^ Koestler, Arthur (1973). The Roots of Coincidence. Vintage. ISBN 0-394-71934-4. ^ a b Jung, Carl (1973). Synchronicity: An Acausal Connecting Principle (first Princeton/Bollingen paperback ed.). Princeton, New Jersey: Princeton University Press. p. 8. ISBN 978-0-691-15050-5. ^ Main, Roderick (1997). Jung on Synchronicity and the Paranormal. Princeton University Press. p. 1. ^ Brown, R.S. (2014). Evolving Attitudes. International Journal of Jungian Studies, 6.3, 243–253. ^ Igor V. Limar (2011). "Carl G. Jung's Synchronicity and Quantum Entanglement: Schrödinger's Cat 'Wanders' Between Chromosomes". NeuroQuantology. 09 (2): 313. Archived from the original on 2011-11-20. Retrieved 2012-03-18. ^ Main, Roderick (2007). Revelations of Chance: Synchronicity as Spiritual Experience. The State University of New York Press. ^ Jung, C.G. (1969). Synchronicity: An Acausal Connecting Principle. Princeton, New Jersey: Princeton University Press. pp. 109–110. ISBN 978-0-691-15050-5. ^ Bishop, Paul (2000). Synchronicity and Intellectual Intuition in Kant, Swedenborg, and Jung. The Edwin Mellen Press. pp. 59–62. ISBN 978-0-7734-7593-9. ^ Brugger, Peter. "From Haunted Brain to Haunted Science: A Cognitive Neuroscience View of Paranormal and Pseudoscientific Thought", Hauntings and Poltergeists: Multidisciplinary Perspectives, edited by J. Houran and R. Lange (North Carolina: McFarland & Company, Inc. Publishers, 2001). ^ Svoboda, Elizabeth (2007). "Facial Recognition – Brain – Faces, Faces Everywhere". New York Times. Archived from the original on 2017-05-11. Retrieved 2017-02-23. ^ Charles Tart, Causality and Synchronicity – Steps Toward Clarification Archived 2015-09-24 at the Wayback Machine, (1981), Journal of the American Society for Psychical Research, vol. 75, pp. 121–141. ^ Von Franz, M.L. (1974). Number and Time: Reflections Leading toward a Unification of Depth Psychology and Physics. Northwestern University Press. ^ Stapp, H.P. (2015). Mind, Matter and Quantum Mechanics. Berlin, Heidelberg: Springer Verlag. ^ Bohm, David (1980). Wholeness and the implicate order. London, UK: Routledge. Aziz, Robert (1990). C.G. Jung's Psychology of Religion and Synchronicity (10 ed.). The State University of New York Press. ISBN 978-0-7914-0166-8. Aziz, Robert (1999). "Synchronicity and the Transformation of the Ethical in Jungian Psychology". In Becker, Carl (ed.). Asian and Jungian Views of Ethics. Greenwood. ISBN 978-0-313-30452-1. Carey, Harriet (1869). "Monsieur de Fontgibu and the Plum Pudding". Echoes from the Harp of France. p. 174. Cederquist, Jan (2010). Meaningful Coincidence. Times Publishing Limited. ISBN 978-0-462-09970-5. Combs, Allan; Holland, Mark (2001). Synchronicity: Through the Eyes of Science, Myth, and the Trickster. New York: Marlowe. ISBN 978-1-56924-599-6. Franz, Marie-Louise von (1980). On Divination and Synchronicity: The Psychology of Meaningful Chance. Inner City Books. ISBN 978-0-919123-02-1. Jaworski, Joseph (1996). Synchronicity: the inner path of leadership. Berrett-Koehler Publishers Inc. ISBN 978-1-881052-94-4. Haule, John Ryan (2010). Jung in the 21st Century: Synchronicity and science. Routledge. ISBN 978-0-203-83360-5. Koestler, Arthur (1973). The Roots of Coincidence. Vintage. ISBN 978-0-394-71934-4. Main, Roderick (2007). Revelations of Chance: Synchronicity as Spiritual Experience. The State University of New York Press. ISBN 978-0-7914-7024-4. Mardorf, Elisabeth. Das kann doch kein Zufall sei (in German). Mansfield, Victor (1995). Science, Synchronicity and Soul-Making. Open Court Publishing Company. ISBN 978-0-8126-9304-1. Peat, F. David (1987). Synchronicity, The Bridge Between Matter and Mind. Bantam. ISBN 978-0-553-34676-3. Progoff, Ira (1973). Jung, synchronicity, & human destiny: Noncausal dimensions of human experience. New York, Julian Press. ISBN 978-0-87097-056-6. OCLC 763819. Wilhelm, Richard (1986). Lectures on the I Ching: Constancy and Change Bollingen edition. Princeton University Press; Reprint. ISBN 978-0-691-01872-0. Igor V. Limar (2011). "Carl G. Jung’s Synchronicity and Quantum Entanglement: Schrödinger’s Cat ‘Wanders’ Between Chromosomes". NeuroQuantology Journal, 09 (2). pp. 313–321.